Our RYA instructor Pere Valera Taltavull is the head of study and instructor of our courses RYA (Royal Yachting Assoctiation). Accumulating more than 60.000 miles of sailing, he is titled as a professional skipper by the Spanish Merchant Marine graduated at RYA as Yachtmaster Ocean. He started his professional career in 1998 in the world of charter. An Activity he always combined with other works, all related to nautical topics.He has patroled boats of different lenghts and has made different oceanic crossings. 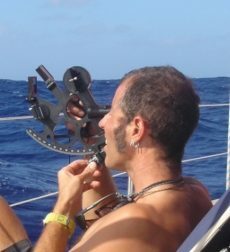 He is very passionate about traditional navigation, as well as combining it with the most modern navigation methods. In 2013-2014 he was captain of the ship Sterna, an Open 85 , dedicated to the charter of adventure and training of sailors.He went to ocean voyages with this ship and in remote areas such as Svalbard or Greenland, he crossed the Atlantic several times. Currently, he is collaborating with the OCEANA Fundation, a fundation in charge of protecting maritime areas of special interest.He started to be the captain of the ship Ranger, an aluminium catamaran with a length of 21.64m. Later he participated in another project in Lebanon, where he was chief of maneuvers and in charge of the logistics of Tug Sea Patron (Ship of 42m). Beginning as a Student, Pere acquired experience and knowledge about the point of becoming a valued instructor. In 2010 he founded and directed one of the first schools in Spain to teach RYA courses. The school, ruled by a Spaniard, was called Menorca Yachting BCN. After five years of being head of instructors of Menorca Yachting BCN, he began to work as a Official examiner at RYA. At the same time, he was an instructor in schools and nautical clubs. It provided Spanish navigation courses, comparable to the RYA Yachtmaster Ocean degree. Today, with the help of Yacht Point RYA Training Center and as head instructor, he teaches students the art of sailing and, most importantly, the experience. Pere Valera Taltavull is undoubtedly a recognized teacher with a desire to transmit his knowledge and to be the mentor of great future navigators. So do not miss the chance to join!